Description: Cape ivy (Delairea odorata) is a perennial climber that vigorously forms thick mats of twining foliage which smothers nearby vegetation. The leaves are alternate, fleshy, smooth and glossy, mid to lime green, with a typical ivy shape. The lobes are more or less triangular and entire, or the basal lobes may be notched. There is usually three to seven lobes. 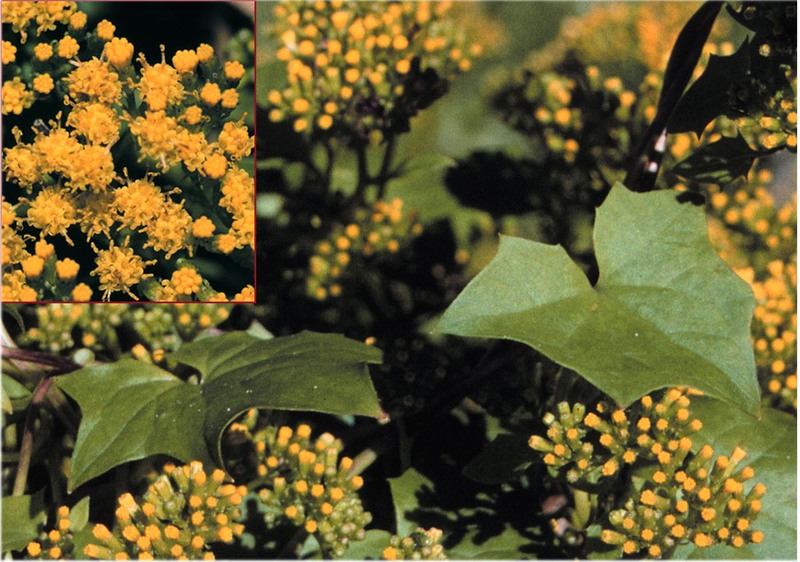 Numerous small, densely packed, golden-yellow flowers are present from winter to early spring. Reproduction: Cape Ivy seeds are feathery and similar to a dandelion's seeds. They are spread by the wind but the plant can also spread vegetatively by sending out roots from the leaf nodes, so all plant parts must be removed and disposed of properly. Distribution: Found in wet moist gullies and semi-shaded forested areas, mainly on the central and north coast. Problem: Cape Ivy, like other vines, requires an opening in the canopy to initiate growth which is why remnant vegetation with a high edge ratio is particularly vulnerable. Once established it quickly outgrows the other growth forms as it expends little energy on supportive structures. Cape Ivy also has the ability to change the structure of forested areas by causing large gaps in the canopy due to dieback of smothered trees. It is therefore essential when clearing large infestations of Cape Ivy that re-establishment of the canopy is encouraged to speed up the regeneration process and inhibit regrowth of Cape Ivy seedlings. Control: Remove flower heads when they first appear to prevent seed dispersal. Remove as much plant material as possible from the site. Cover the cleared area with a thick mulch or introduce competitive ground cover to deter regrowth.